The original sandwich. The Hellmannâ€™s Club is a light bite, perfect for sharing with your fiancÃ© after a game of doubles at the racquet club. 1 Toast the bread. Spread half the mayonnaise on the two slices for a layer of deliciousness, then top with some lettuce, tomato, cucumber and a slice of chicken. 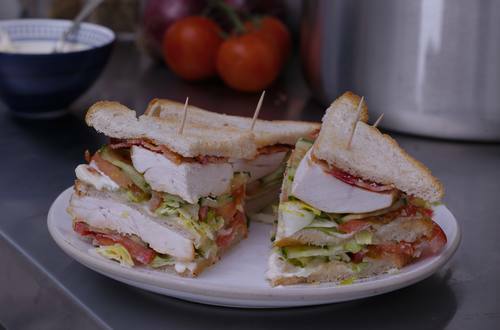 2 Add a new slice of bread on top of the chicken and spread with remaining mayonnaise for another layer of creaminess, then place the lettuce, tomato, cucumber and crispy bacon on the bread, then put third slices of toasted bread on top of the bacon. 3 Cut the sandwiches into two diagonal pieces and insert cocktail sticks to hold the club sandwich together. 4 Leap in the convertible, and zoom off to your next social or business engagement.